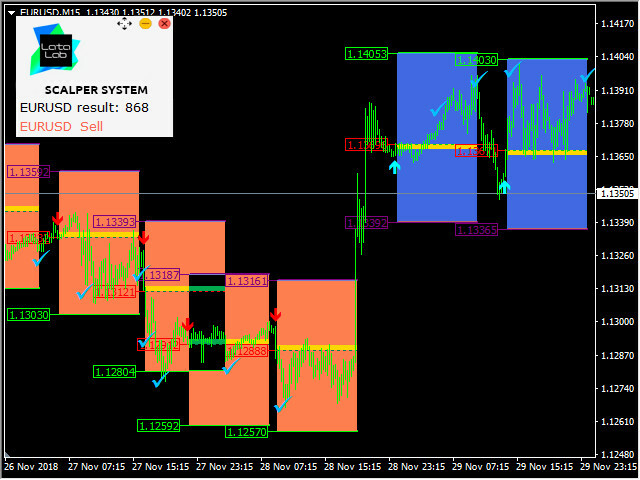 This is a multi-currency author strategy, designed for trading on the M1, M5, M15, М30, Н1, Н4. Entry points are calculated using custom formulas and algorithms that allow you to effectively determine current trend in the market, obtain the entry points (buy/sell) and the optimal levels to close orders. 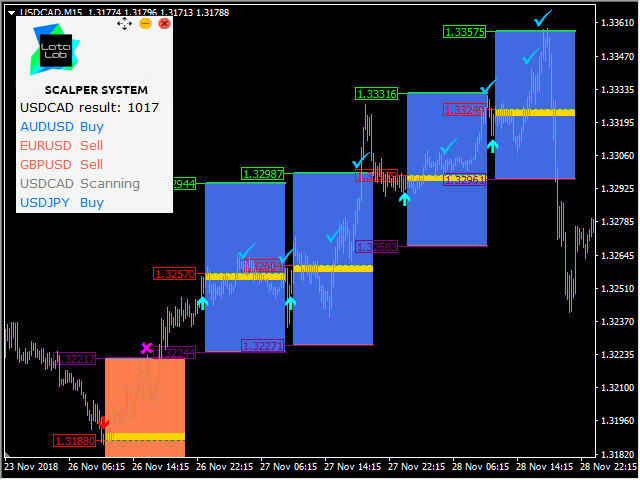 The Cosmic Diviner Scalper System indicator can be used on any Forex pairs. A huge advantage of Scalper System is the availability of an information panel in which the user can see the current information on potential entry points, simultaneously on all trading instruments on which the indicator is installed. Also, in the information panel, the actual information on the results of the previous transactions (in pips) is displayed. 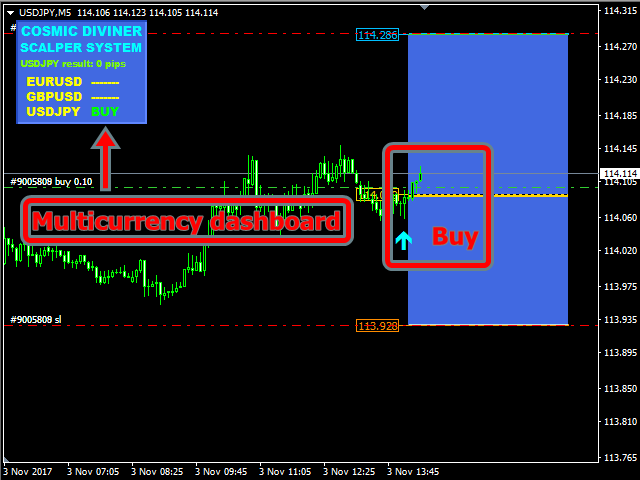 The system is equipped with a dialog box in which you can get up-to-date information on entry points, the achievement of Take Profit and Stop Loss levels, and optionally you can connect sound information. The indicator is equipped with a very convenient visualized trading zone in the form of a blue square - when a Buy signal appears and a red square - when appears a signal for Sell. When the entry points appear, the indicator displays recommended levels of Take Profit and Stop Loss in the form of horizontal lines with price tags. The Cosmic Diviner Scalper System is designed for scalping. For maximum efficiency the indicator includes built-in filters for pre-term trade exit depending on the market situation and currency pair fluctuations. The options for using the strategy are described below. The Cosmic Diviner Scalper System indicator is never redrawn. Buy Signal - blue arrow pointing upwards, on the chart visualized blue trading zone. Sell ​​signal - red arrow pointing down, on the chart visualized red trading zone. The zone of the recommended maximum Take Profit setting is displayed as a horizontal line with a blue price tag. 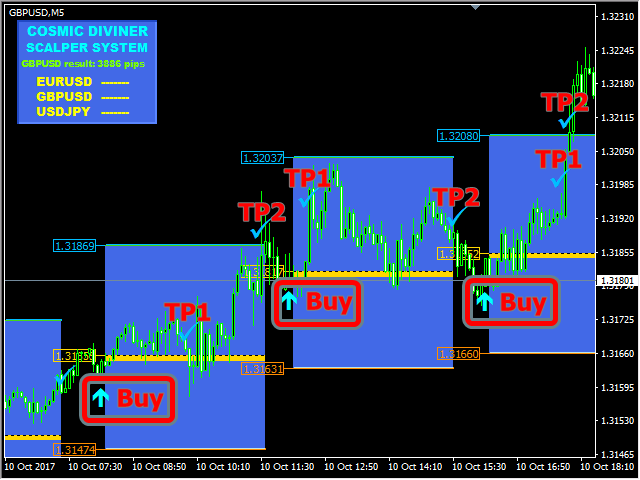 Level TP1 - first Take profit Scalping the target is displayed as a blue tick. 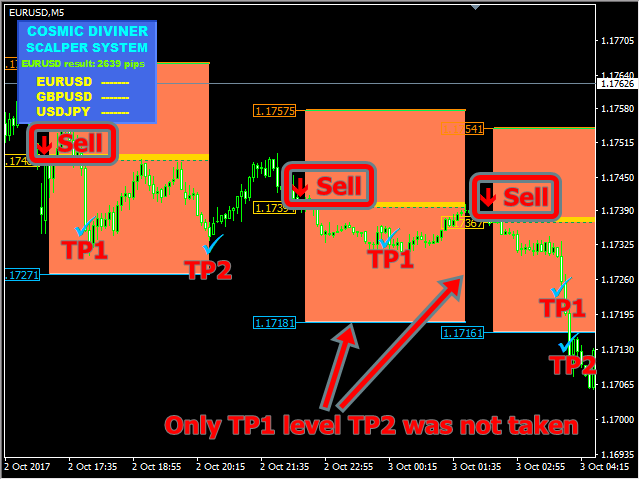 Level TP2 - second Take profit Max target - displayed as a blue tick at the level of the horizontal line of the Max TP installation. 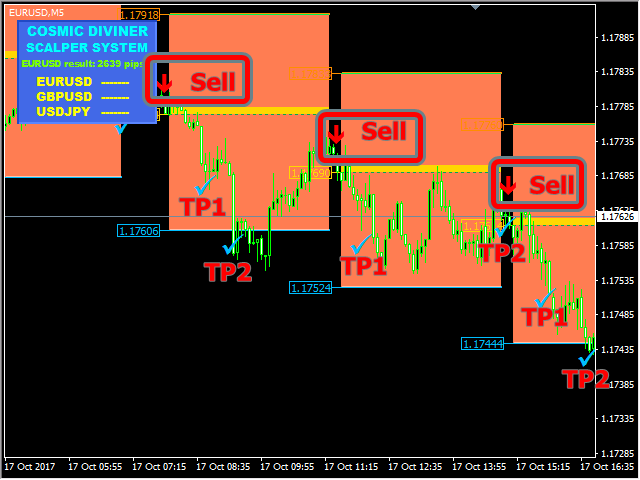 In case the price does not take the Max TP, we recommend closing the position at the end of the visualization zone. When one blue tick appears to fix a profit - a quick scalping goal. When one blue tick appears, fix half the profit and transfer the SL to a breakeven. When two blue ticks appear, close the order. The zone of the recommended Stop Loss installation is displayed as a horizontal line with a price tag of orange color. The appearance of the pink cross at the end of the visualized trade zone means a recommendation to exit from the open position. Alert and sound (true/false) - alert and sound on/off. Push-notification Enter (true/false) - push-notification on/off. Push-notification TP and SL (true/false) - push-notification for TP and SL on/off. Colors in Zones - color scheme for trading zones. Color Buy Zone - choose color for the Buy zone. Color Sell Zone - choose color for the Sell zone. Color Spread Zone - choose color for the Spread zone. Color Price Open - choose color for the Open price. Color Price Take Profit - choose color for Take Profit. Color Price Stop Loss - choose color for Stop Loss. Color Arrows - choose color for arrows. Color Arrow Up - choose color for the up arrow. Color Arrow Down - choose color for the down arrow. Color Check Sign - choose color for the take profit signal. Color Stop Sign - choose color for the stop signal. Colors in the Table - color scheme for the information table. Table Background Color - choose color for the table background. Color of Indicator Name - choose color for the indicator header. Result color - choose color for the table results. Color of Symbols - choose color for the table symbols. So far works good and gives frequent trade opportunities. I recommend to add your own filter like time of day, upcoming news/economic sentiment etc before entering the trade. The Author ask people to add review here in favor of their product and take a free indicator. Very good indicator. Support is also very prompt and professional. Very nice concept indicator, the visualization helps in determine optimal results. Good indicator, expect more profit. 3) The Boss is beautiful & Smart and the team is wonderful. !!!!! After the new update it became even more useful and fits into my strategy nicely, good indicator & good developer !!! One of the best indicator i've ever use. It fits into my trading system and strategy. Good Job !!! 3. Improved information panel settings. 1. Optimized settings for the strategy tester. the table can be turned on, off, collapse, move. 2. The information table is adapted to work in the strategy tester. 3. Added the ability to change sizes: arrows, check marks, cross. 4. Added notifications on email; added alerts information about the time frame of the incoming signal. 1. Added parameters for changing the color schemes of the indicator. 1. The indicator is optimized for trading on four-digit quotes.